Nokia views the Lumia 925 as a “new interpretation” of the Lumia 920 (review), rightfully so seeing that the device is basically a Lumia 920 in a thinner, lighter and slightly more premium frame. Is it a worthy contender in the modern smartphone space? The company’s latest smartphone reduces the bulky 920’s all-polycarbonate frame (10.7 mm; 185 g) to a much more manageable (8.5 mm; 139 g) one. Most of the device is still made from plastic, but the Lumia 925 does sport a more premium feel in hand (sorely lacking from every other Lumia), thanks to the aluminium rim covering surrounding the device. Espoo’s design star, however, is the 4.5" PureMotion AMOLED WXGA (768 x 1280; 332 ppi) display. This screen does not pack the full HD resolution muscle found on rivals the likes of LG’s Optimus G Pro (review) or the Galaxy S4 (review). Despite this, it offers plenty of detail, excellent viewing angles and enhanced colour saturation compared to the Lumia 920’s 4.5" (768 x 1280 resolution; 332 ppi pixel density) PureMotion HD+ IPS LCD. Nokia also included its regular screen technology staples - ClearBlack and Super sensitive touch - with the former ensuring good readability in direct sunlight outdoors and the latter enabling users to use the smartphone whilst wearing gloves. 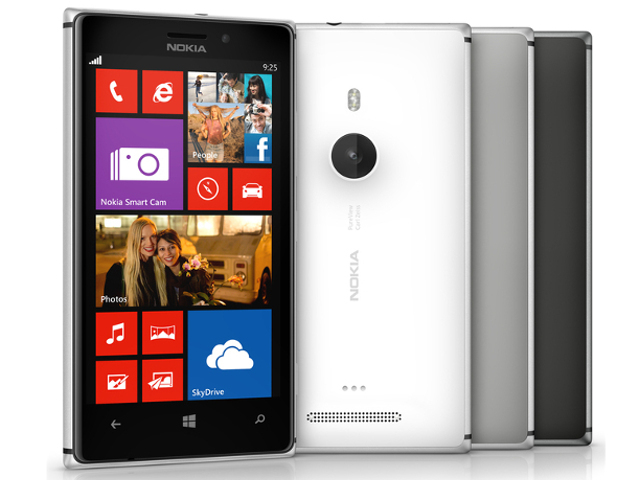 Despite not being a full HD panel, the 4.5" AMOLED screen of the Lumia 925 is one of our favourite smartphone displays. Another big drawcard in the Lumia 925’s appeal deck can be found on the back of the device, namely its 8.7 megapixel PureView autofocus camera. This rear-facing camera sports optical image stabilisation that helps to keep your still images blur-free and also delivers tripod-like stability to your videos. We appreciated the physical shutter button on the right hand side of the device, but not the placement of the camera. It cannot be found near the top of the smartphone as per usual, but is housed lower down towards the middle, where one’s index finger naturally tends to rest. This means that you are either constantly blocking the camera with your finger at worst, or at best dirtying it with fingerprints. In terms of performance, this camera produced sharp photos during good lighting conditions, on par with any of the 13 MP shooters currently found on high-end smartphones. At night or in poor lighting conditions, however, the main camera plays in a league of its own, with pics turning out much clearer and brighter than any other smartphone camera on the market. This main shooter is backed up by a 1.2 MP wide-angle front-facing snapper for video-calls as well as for capturing selfies. Beyond the hardware, Nokia also offers lots of software features to make the most of the capable camera hardware, though this does not include HDR shooting mode. The Lumia 925’s Smart Camera app enables users to capture quick burst shots of up to ten images. You are then able to utilise these pictures in a variety of ways. These includes Best Shot, whereby the smartphone chooses the best photo out of all of the ten pictures based upon an algorithm, and Action Shot that allows users to create a stop-motion photos. It does this by combining all ten photos into one image, showing the various movements of your subject. The former is useful for users who do not want to fiddle around with camera settings, whilst the latter enables some interesting shots, especially at sporting events. Users that do like to tinker with the settings of their smartphone’s camera can opt for the Nokia Pro Cam application, to manually adjust a plethora of settings such as the white balance, focus, ISO, and shutter speed. This app works a treat and comes standard on the Lumia 1020, whilst Lumia 920 and Lumia 925 owners can download it from the Microsoft Store once their devices have been upgraded with the Lumia Amber software update for Windows Phone 8. Although we aren't fans of the placement of the rear camera, it is an undeniable shooting star when it comes to low-light photography. The Amber update bring a number of other improvements, including FM Radio (selectable within the Music + Videos application), Microsoft’s excellent Data Sense app, which helps you monitor and set limits for your data usage, and the ability to mute incoming calls simply by flipping the phone over. Also on offer on the Lumia 925 courtesy of the Amber update is Nokia Glance Screen, which conserves battery life by displaying a clock plus other indicators such as battery status when your smartphone is inactive for a while. You can wake the phone up by double tapping on the homescreen, thus circumventing the need to use the dedicated unlock button. Nokia’s Lumia devices boast a wealth of software add-ons including the excellent Here Drive+ (turn-by-turn voice-guided navigation), #InstaWithLove (unofficial Instagram client for Windows Phone devices) and a free (as well as ad-free) streaming music service in Mix Radio. However, app addicts should take note that there are notable apps missing from the Windows Phone Store, including Vine, Flipboard, and Path, for instance. According to Nokia SA these applications will all make their way to the Store before the end of this year. Despite offering what can be considered midrange specs by Android standards, navigation of the OS and running multiple apps simultaneously is both smooth and snappy. The Lumia 925 is powered by Qualcomm’s Snapdragon MSM8960 chipset, which boasts a dual-core CPU clocked at 1.5 GHz per core and this is coupled with 1 GB of RAM. Also onboard is 16 GB worth of non-expandable internal storage, Bluetooth 3.0, NFC, Wi-Fi 802.11 n, GPS with aGPS assistance plus Glonass, LTE (4G) connectivity, and a large 2000 mAh battery that will get you through a full day’s usage. As on the Lumia 820 (review), users can utilise an optional wireless charging back cover to enable this feature on the Lumia 925. Although we did not get said cover in the box with our test unit, Nokia SA assured that local buyers will get this wireless charging cover with their device when purchased in South Africa. 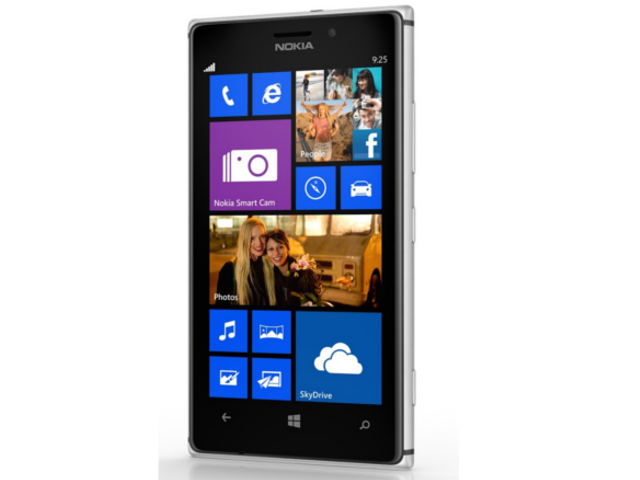 Nokia’s Lumia 925 is the best smartphone the company has made thus far (up untill the Lumia 1020 arrives early next month) and currently the class-leading Windows Phone smartphone on the market. By definition, that also makes it the best mobile to go for when looking for an alternative platform to iOS or Android (sorry BlackBerry). The device offers great camera performance, LTE connectivity, a premium look and feel in hand, as well as a beautiful display despite not delivering full HD resolution. The Lumia 925 sells for a recommended retail price of R9 000 - far too expensive seeing that you can get the Galaxy Note 3 for that price, which blows the Lumia 925 right out of the water in terms of specs and software add-ons. Sturdy build and excellent design; LTE connectivity; excellent camera performance; runs the latest software out of the box; FM Radio; and you get wireless charging shell for free when you buy the phone. Expensive; a few sought after apps still missing from Windows Phone Store; and no microSD memory card slot.